The main part of this contraption is a gantry system, actuated with a DC motor and string. 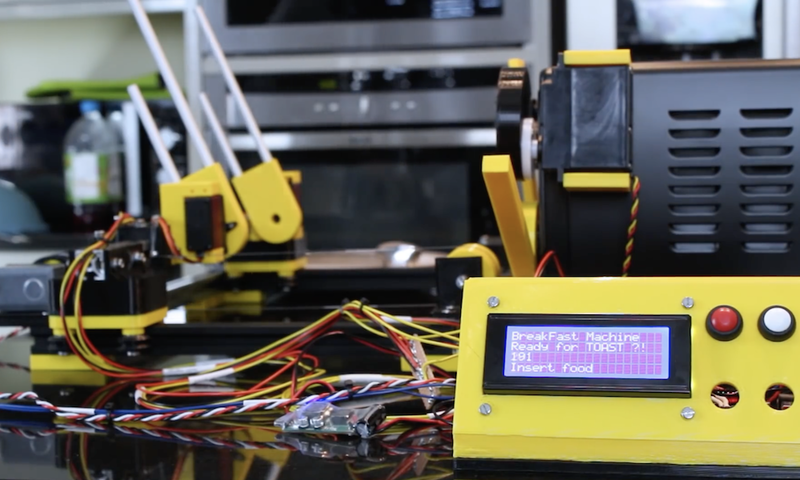 Two fork assemblies are attached to independent servos on this gantry, and lift the cooking tray as needed for manipulation. When it’s time to unload, the tray is pulled back out of the toaster oven, then the contents are flipped into an awaiting container via the fork-servos. Opening the toaster oven door is done via another servo assembly, and turning the oven on is cleverly handled by a lever mechanism affixed to the timer dial. Yet another servo turns the lever using a cam, meaning Bruton doesn’t have to deal with mains circuitry. Electronic control for the device is provided by an Arduino Mega, chosen for its multiple serial ports for eventual coordination between machines. More info on both the egg and toast machine is available on GitHub, and it’ll be interesting to see how the overall project progresses. Hopefully the result will be a Rube Goldberg-esque contraption, able to cook an entire breakfast with the push of a button, and a plethora of coordinated contraptions! 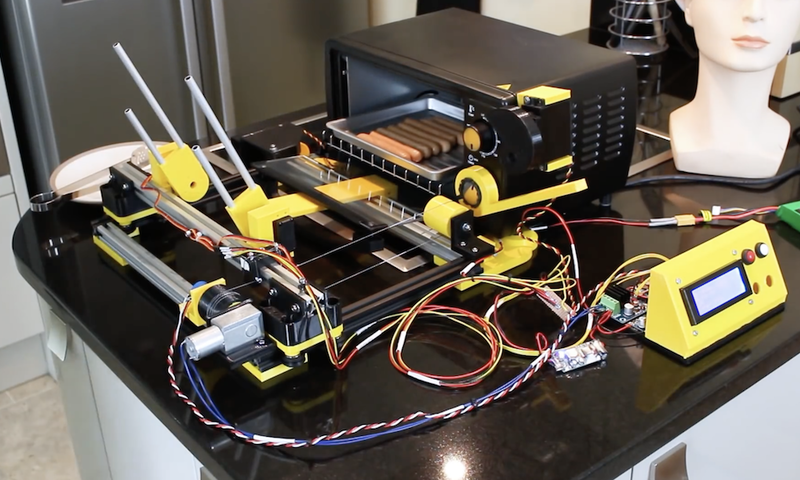 Breakfast Machine Cooks Toast…Or “American Hot Dogs” was originally published in Hackster Blog on Medium, where people are continuing the conversation by highlighting and responding to this story.